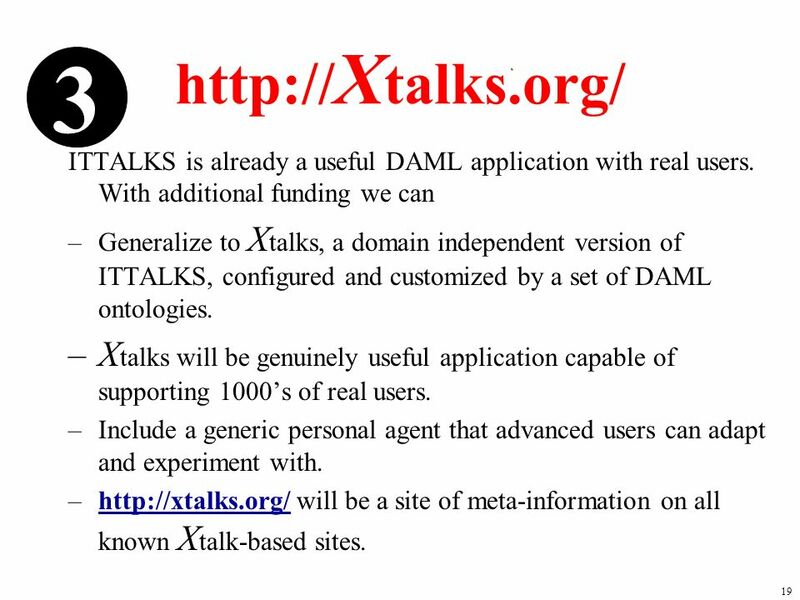 1 X talks Tim Finin University of Maryland Baltimore County Joint work with JHU/APL and MIT/Sloan DAML PI Meeting July 18, 2001 ask-all advertisesubscribe. 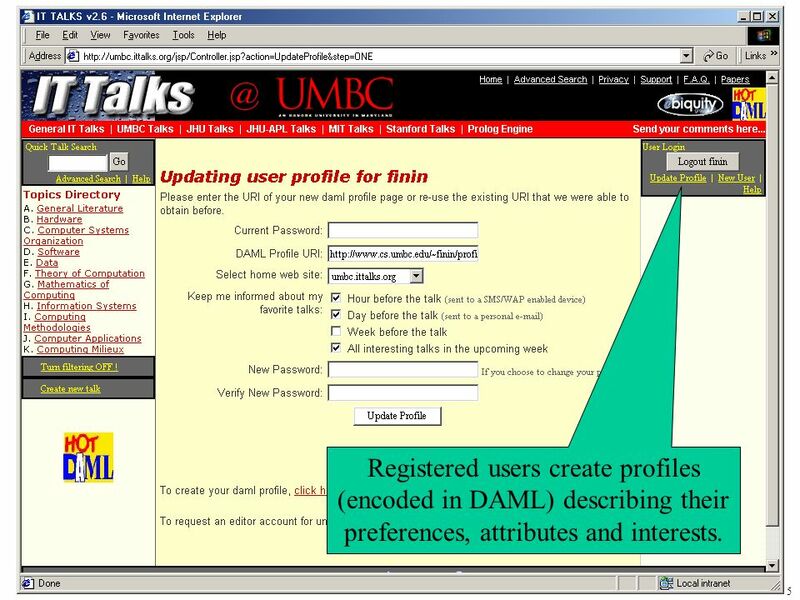 5 5 Registered users create profiles (encoded in DAML) describing their preferences, attributes and interests. 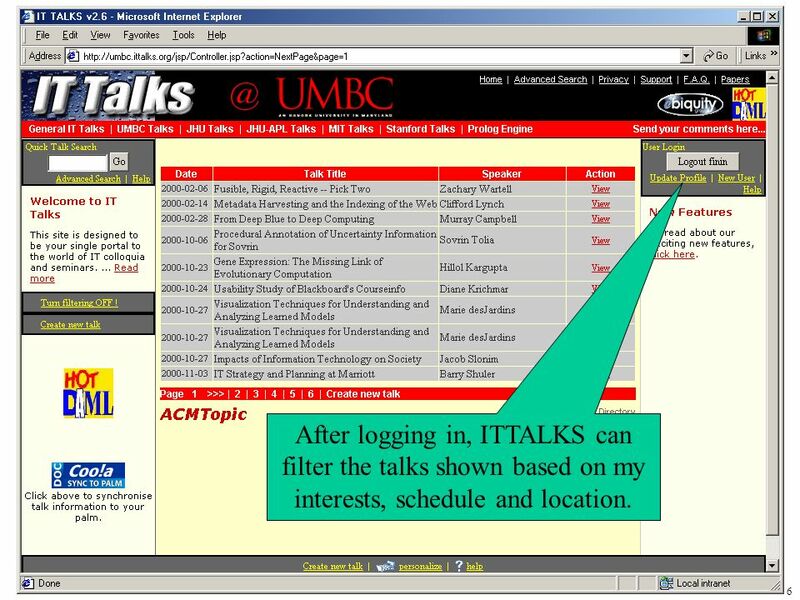 6 6 After logging in, ITTALKS can filter the talks shown based on my interests, schedule and location. 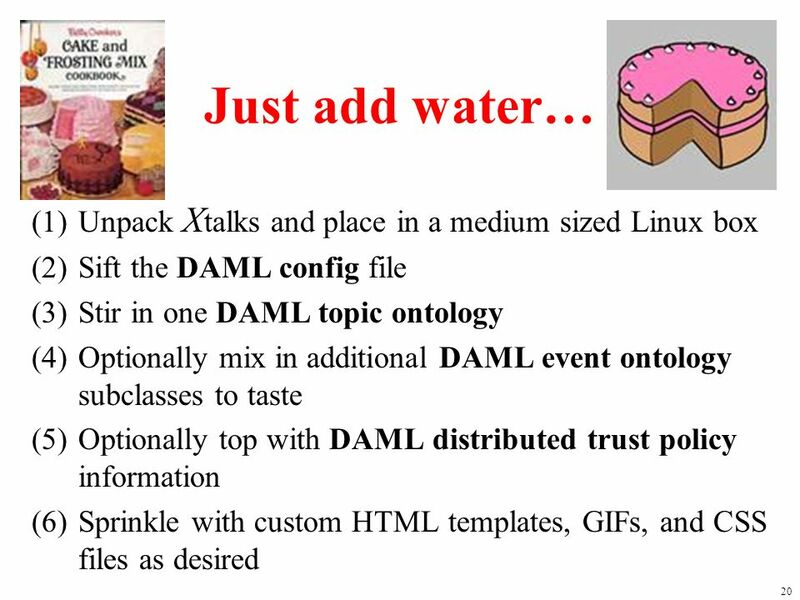 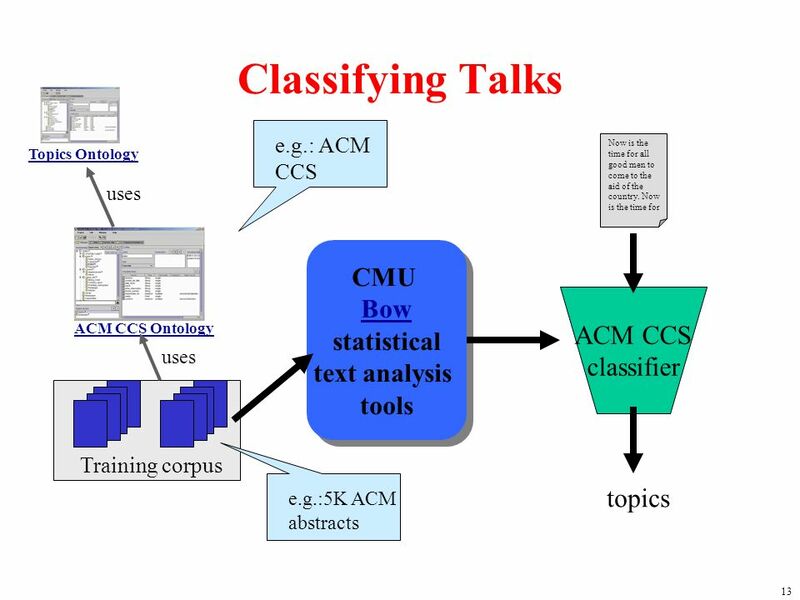 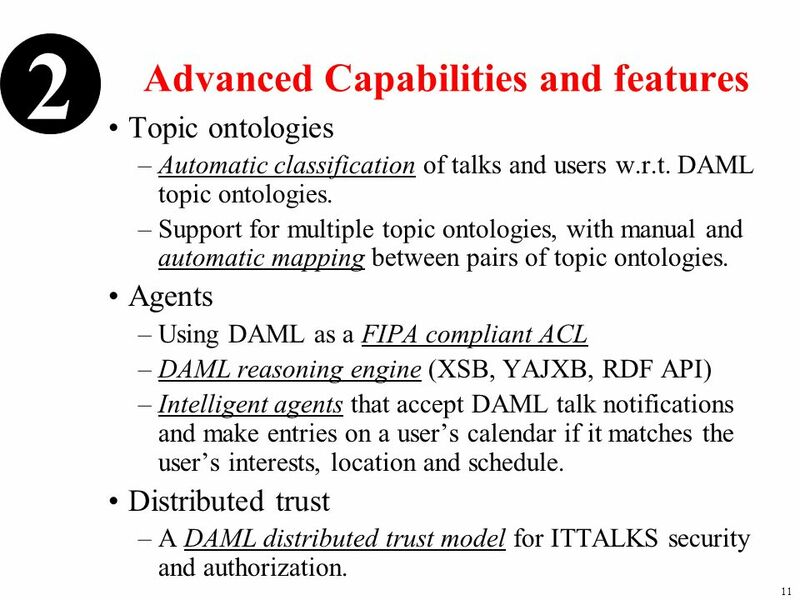 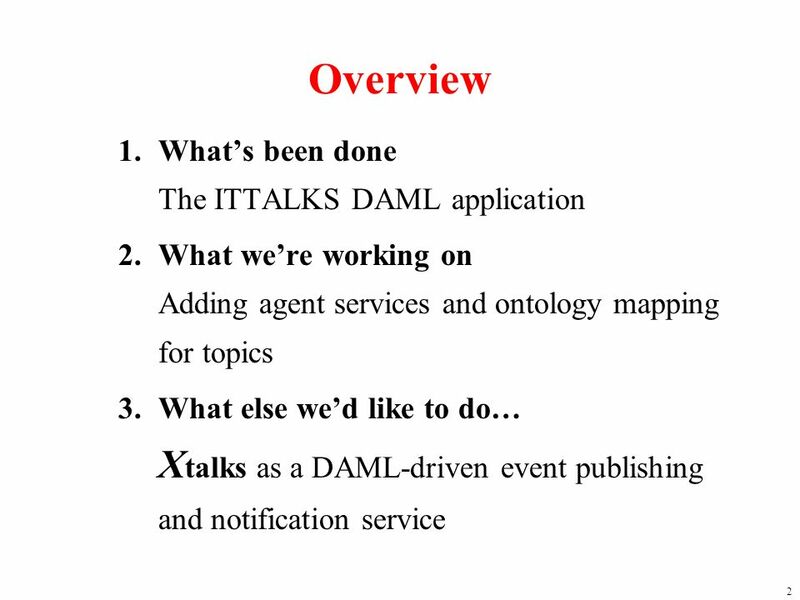 22 22 Benefits X talks has the potential to be a widely used application, helping to make DAML and the semantic web more visible, and demonstrating its utility as an ontology language, an intelligent config language, an ACL, … Widespread use of X talks will make lots of DAML available on the web. 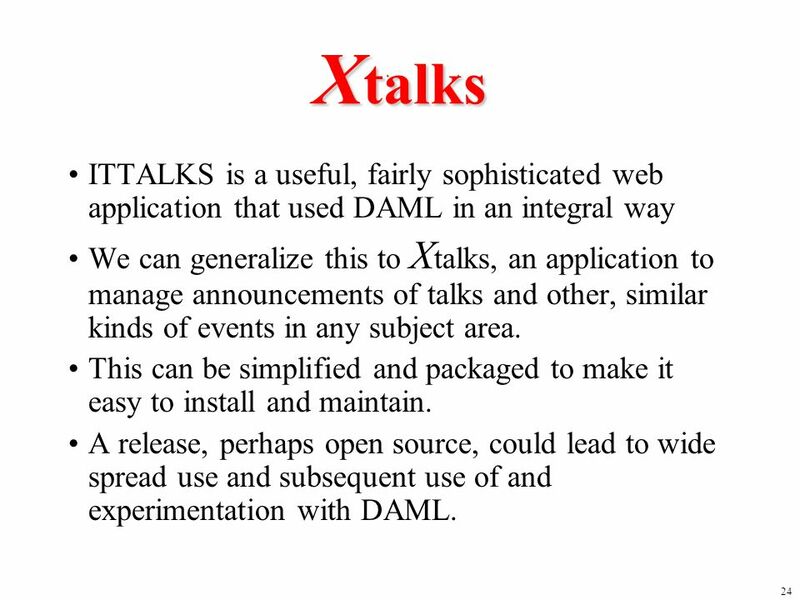 X talks will provide a good DAML application with which people can experiment and extend. 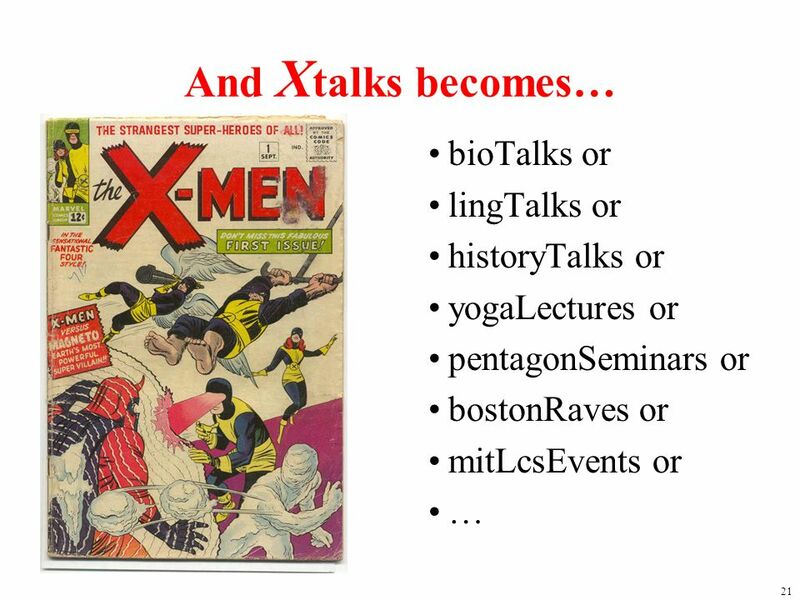 Having a running collection of independent X talks sites will enable interesting research in distributed systems. 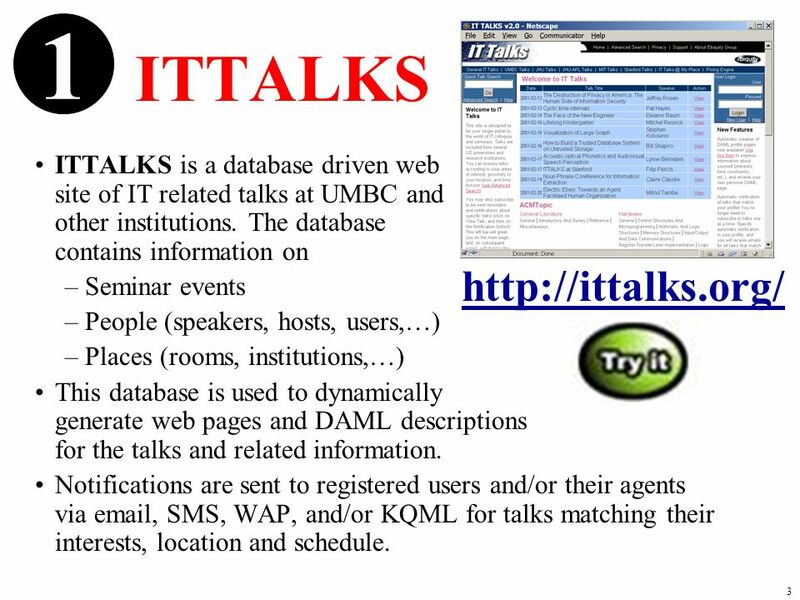 Download ppt "1 X talks Tim Finin University of Maryland Baltimore County Joint work with JHU/APL and MIT/Sloan DAML PI Meeting July 18, 2001 ask-all advertisesubscribe." 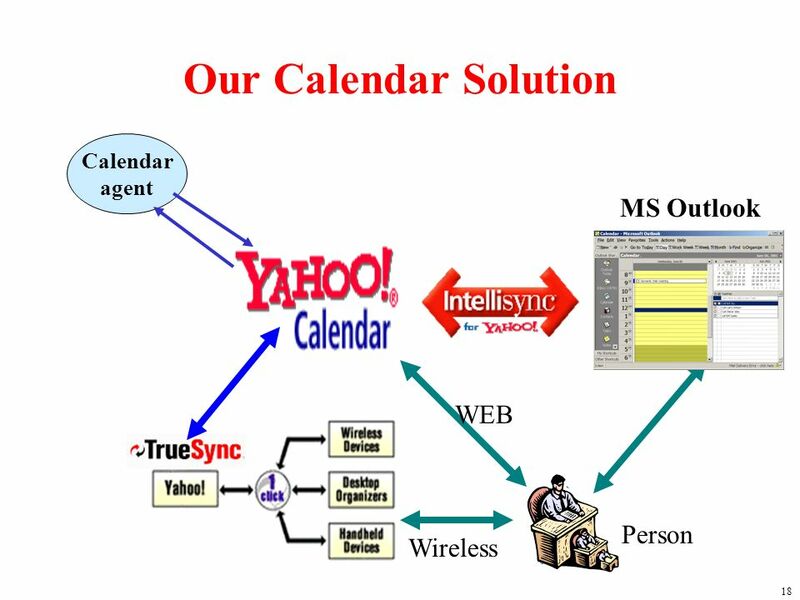 Whats New in Fireware XTM v New Features in Fireware XTM v Major Changes FireCluster with XTM 330 appliances Mobile VPN with SSL using multiple. 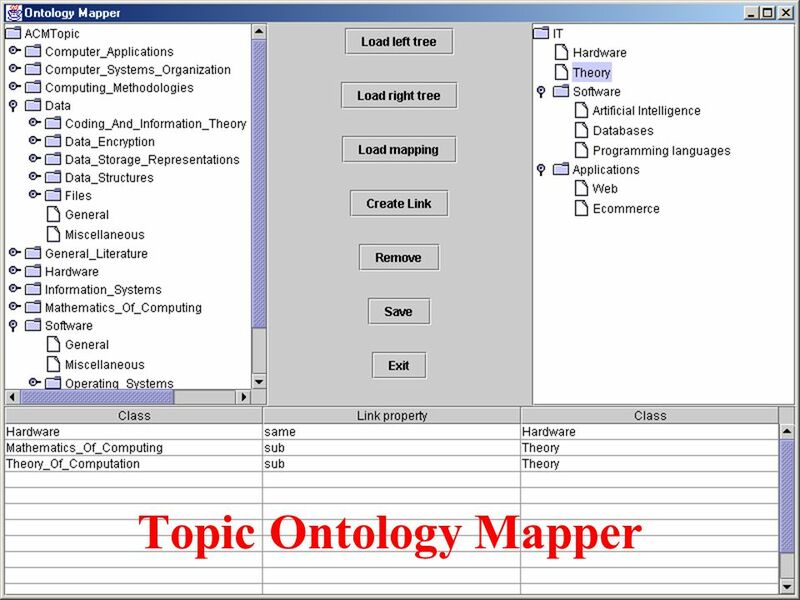 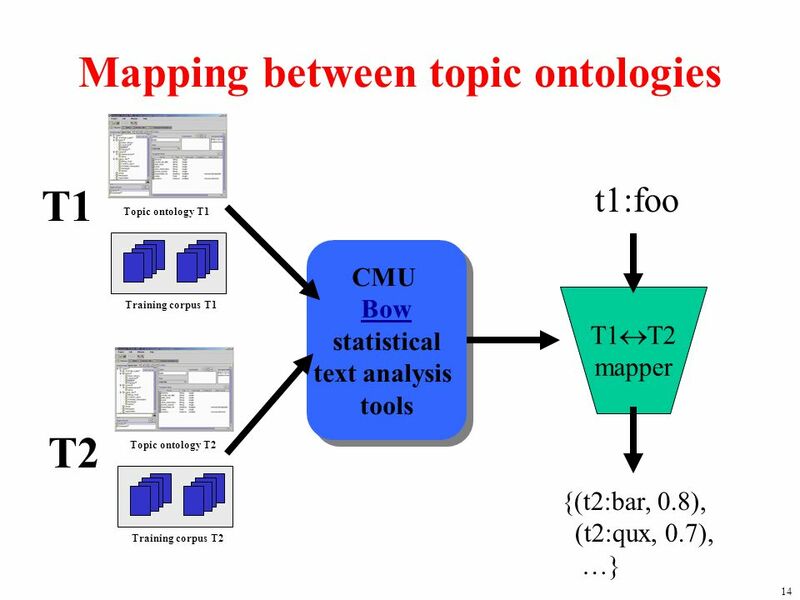 1 Search and Navigate Web Ontologies Li Ding Tetherless World Constellation Rensselaer Polytechnic Institute Aug 22, 2008. 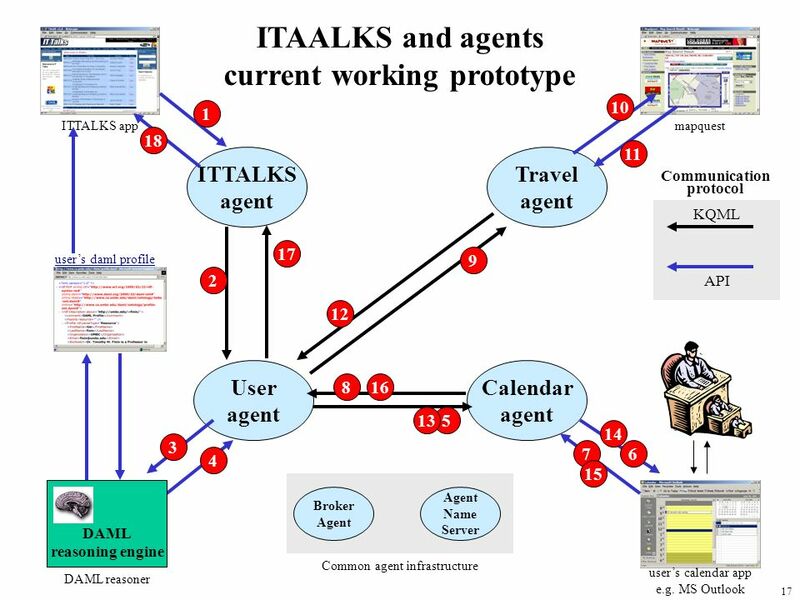 The CODS Protégé Server. 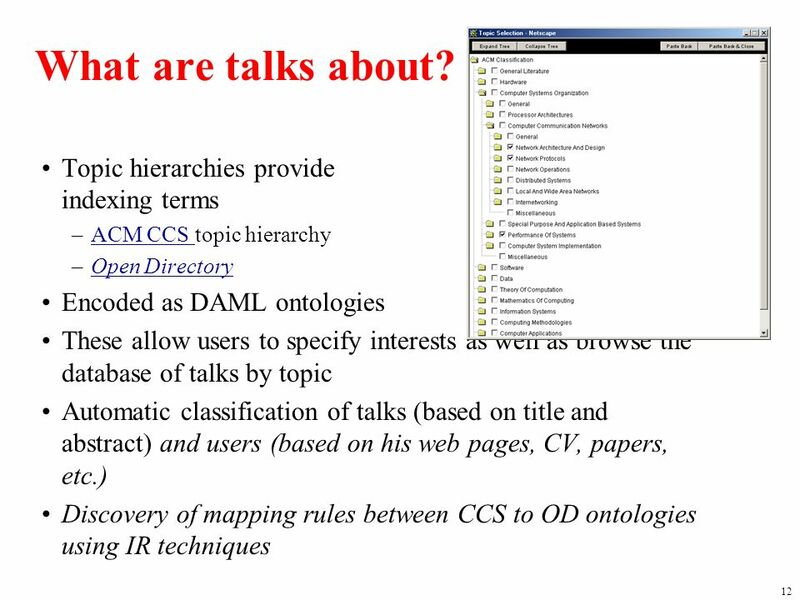 Goals 3 Collaborative Ontology Development Approaches Browse with limited Edit Version Control (analogous to cvs, svn) But should. 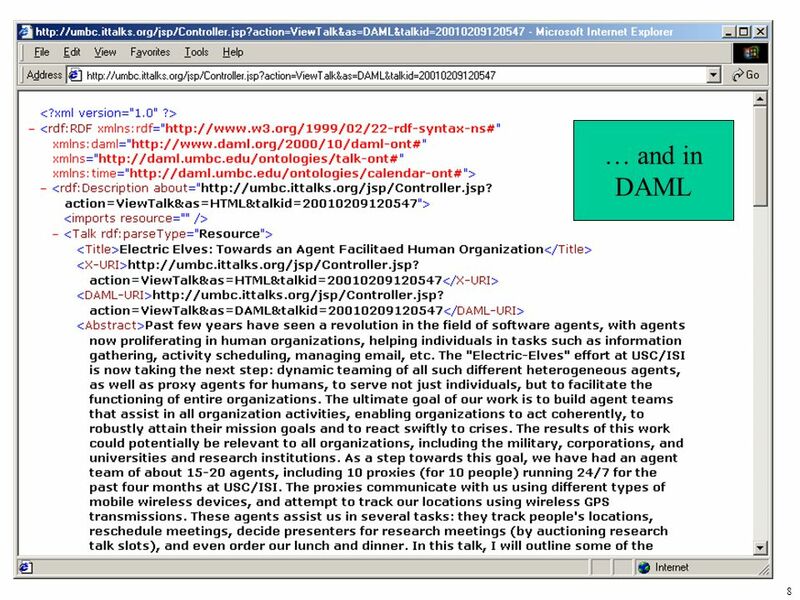 1 An Update on XML.org Registry and Repository Una Kearns Documentum, Inc.
DAML Tools for Intelligent Information Annotation, Sharing and Retrieval UMBC Johns Hopkins University Applied Physics Lab MIT Sloan School July 19, 2001. 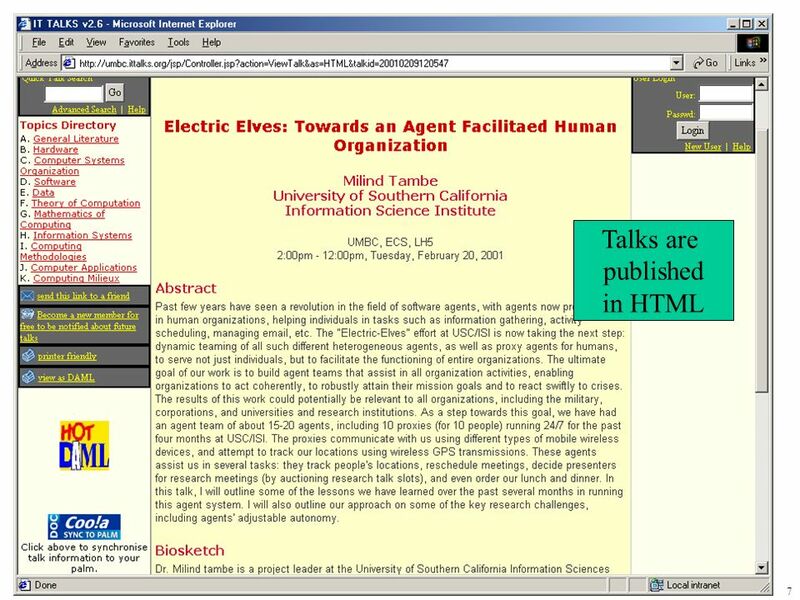 1DAML PI meeting, October DAML and Agents DAML and Agents Breakout Session DAML PI Meeting 17 October 2002 Tim Finin. 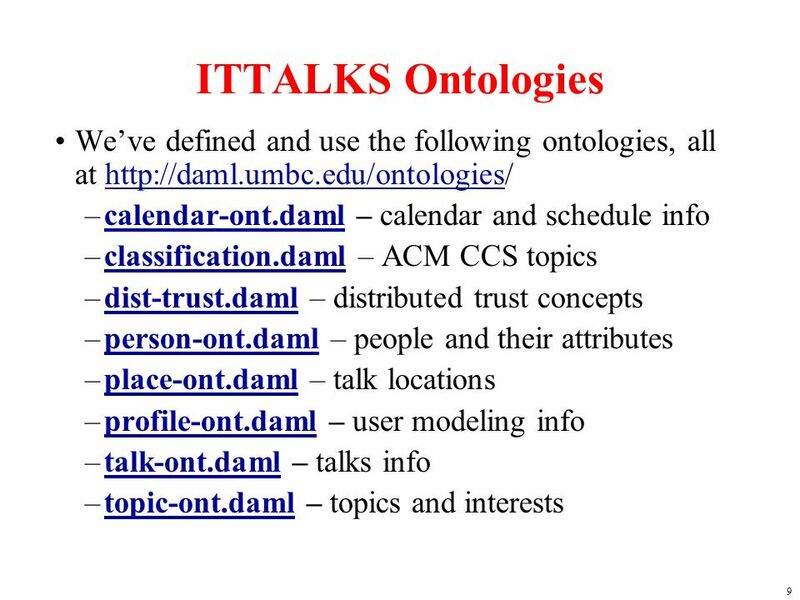 DAML PI Meeting Status Briefing UMBC, JHU APL, MIT Sloan Tim Finin Jim Mayfield Benjamin Grosof February 12, 2002 tell register JHU APL Haircut retrieval. 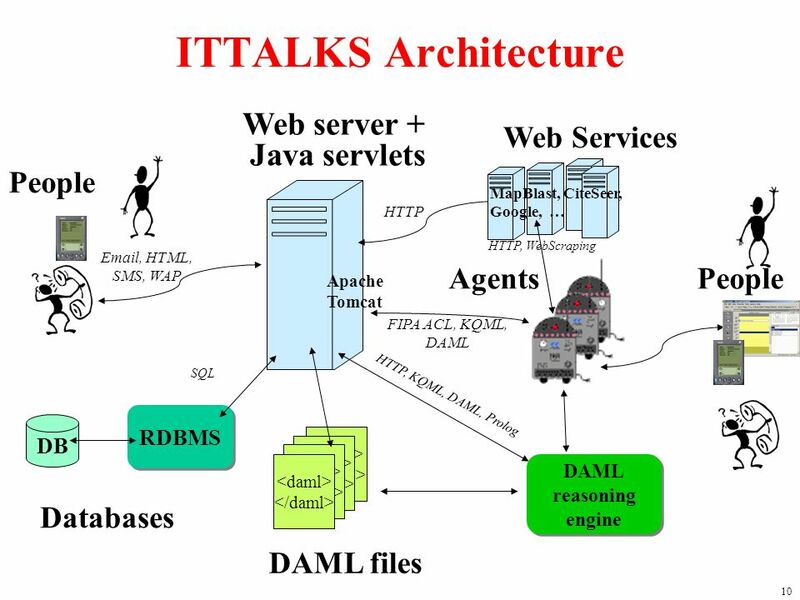 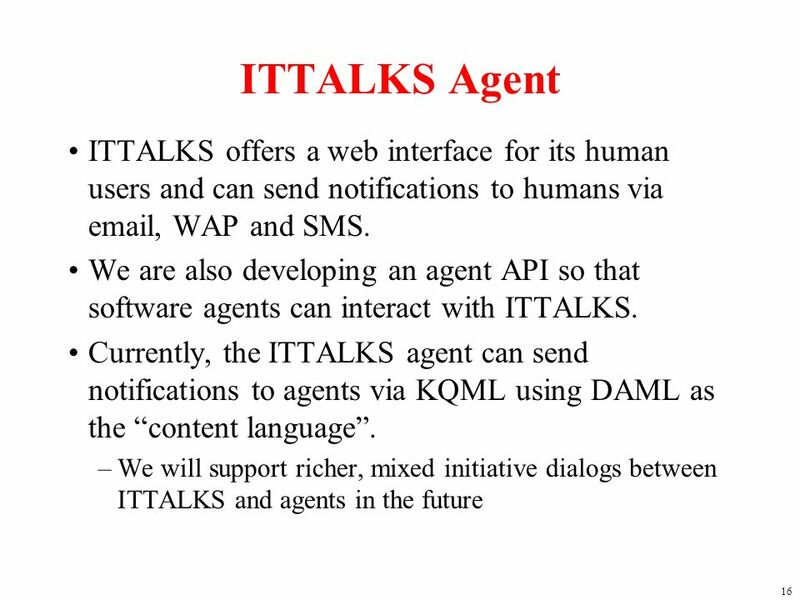 1 ITTALKS ITTALKS A Case Study in How DAML Helps Tim Finin University of Maryland Baltimore County Semantic Web for the Military User June 6, 2001 ask-all.